Just days after the strongest typhoon in history left 10,000 feared dead in the Philippines, the latest round of UN climate talks are getting underway in Warsaw, Poland. After the failure of the talks in Copenhagen in 2009 – when the US forced a weak, voluntary agreement on the conference – many have described these talks as zombies. The latest review of the physical science by the Intergovernmental Panel on Climate Climate Change (IPCC) concluded that although we are currently on a path to a catastrophic 5C rise in global average temperatures, it is technically still possible to avoid dangerous climate change if we switch rapidly to a low-carbon pathway. As a veteran of the UN climate talks, what does Asad Rehman, head of energy and climate at Friends of the Earth think are the prospects of a meaningful outcome at this year’s talks? Phil England spoke to him for Ceasefire. Phil England: Do you think the latest IPCC report will inject a new urgency into the talks? Asad Rehman: Well we hope so. I don’t think we could have a more stark warning from the world’s climate scientists about the need for urgent and ambitious action. They’ve also very clearly set out that to prevent catastrophic climate change by preventing a breaching of key temperature thresholds, such as the two degree level – although a hundred developing countries, most of civil society and many climate scientists believe that a 1.5 degree level is much safer and that two degrees leaves us open to much more dangerous impacts – there is a limited carbon budget and we have to live within that. So now what we have to do is turn that into real political action. Is it the warning bell? I think we’ve had 25 years of warning bells. There’s nothing in the report that we didn’t know before. The warnings are just starker, more grave. But then on a weekly level, we see a new report come out. This week the World Meteorological Organisation issued a report that said emissions are at their highest level and are increasing. So despite the stark warnings, despite the impacts in front of our eyes, despite the testimonies of millions of people around the world, we haven’t turned the corner yet. PE: One of the things that stood out for me in the IPCC report was that since 1990 – around the time these talks started – CO2 emissions have risen by 54% – which really shows that the global community has failed to get to grips with this. With the way that the talks are going, do you see any potential for anything useful coming out of this particular summit? AR: I think the potential positive outcomes of the negotiations are in direct proportion to the power and influence of you and I – of citizens from around the world. It’s only when we increase our power and diminish that of the powerful vested interests who influence our governments to continue business as usual, the fossil fuel industry, that’s the only dynamic that will make the change. It’s thatthat is key. Increasingly we’re beginning to see the re-emergence of a much more vibrant climate movement that is much more focused and understands that the fights are around stopping new dirty energy projects and fossil fuel extraction around the world whether it’s the Arctic, fracking or tar sands. But it’s also being able to put forward real concrete solutions, such as community decentralised energy systems at a global, European and national level. So I think there is real hope. And we hope that now we’re starting to see some of these issues being reflected in the negotiations that we can begin to see some progress. Will these negotiations save the planet? No. Do they have the potential to do that? Of course. And we are the key ingredient, as global civil society and global movements. It’s as stark as that. The stronger we are, the more likely we are to see an outcome in the climate negotiations. PE: In terms of the power dynamics within the talks, the rich world seems to hold sway. They’re obviously better resourced and can bring bigger delegations. And the EU is central to that – they seem obsessed with this idea of carbon trading as the only solution. But there are genuine solutions on the table from the Global South and civil society. What kind of things should we be doing if we want to make a difference in the time frame the IPCC is saying we actually need now? AR: Well I think the most critical one, you’re absolutely right to say, is the broken busted policy initiative, the carbon markets, which we have to step away from. There are proposals from some countries, like some ALBA countries, for a moratorium on new carbon markets to stop the headlong rush into new carbon markets even while existing ones fail. They don’t reduce carbon pollution and are wide open to the problems of both double counting and handing out “permits to pollute” to big dirty industry. For example, one of the sponsors of the climate negotiations this year is ArcelorMittal, the big steel multinational, which receives about €1.6 billion worth of free “permits to pollute” from the emissions trading system – the European carbon markets system. So I think we’ve got to stop those. And there are real solutions on the table such as proposals on global feed-in-tariffs to finance energy transformation throughout the world. Much more concrete, more direct. Not only dealing with the climate crisis but also with the fact that over a billion people around the world don’t have access to any energy at this moment. It can be a win-win for both people and the planet and from a climate perspective as well a social and economic perspective. So those are the things that many of us will be fighting for and are hoping to see some positive outcomes on. PE: Rich countries are going to need to figure out how to finance that. There will be a meeting of finance ministers in Warsaw as part of the talks. They can’t just leave it to the carbon markets or private finance like they always seem to suggest, can they? We need something more. AR: Well unfortunately that seems to be what countries like the United States and others have been proposing, that even the paltry $100 billion that was promised in Copenhagen from 2020 onwards, will come largely either from carbon markets, in the form of loans, or as private capital directly to multinationals. But this is being challenged. We need to see real solutions, like a financial transaction tax, like special drawing rights, like reducing our military expenditure. There are many different budgets and finances out there that can be redirected to ensure that we have adequate finance and that developed countries fulfil their legal as well as their moral and political obligation to help developing countries grow cleanly and face the climate impacts that are already being felt by millions if not billions of people. PE: People always talk about putting a price on carbon but actually we’re doing the reverse at the moment: the ODI says we’re subsidising fossil fuels to the tune of £6 for every £1 we spend subsidising renewal energy and spending over $500 billion a year globally subsidising fossil fuels. This just has to end doesn’t it? AR: Absolutely and this has been one of the demands echoing around the world over the last month. Many different organisations came together in a global month of action called Reclaim Power, which brought together Friends of the Earth, Greenpeace, 350.orog, Jubilee South, Via Campesina and many others to amplify and echo a message that resonates with many different communities and struggles, which is to stop all new dirty energy projects, end tax payer handouts to dirty energy corporations and support decentralised energy systems. In terms of direct and indirect subsidies to big oil and other big fossil fuel industries, the estimates range from half a trillion to about 1.3 trillion dollars. Even here in the UK we hand out every year hundreds of millions of pounds to the oil and coal industry to continue to pollute. We give tax breaks to the fracking industry so that they can continue with their environmentally dangerous and carbon polluting processes. So those have to be stopped and we have to redirect those [funds] to renewable and safer energy systems that are going to save the planet, [as well as] help provide new green jobs for the millions of people who are facing the crisis of austerity. PE: What do you see as the main reason that the global community has failed to get to grips with the problem of climate change over the last nearly 25 years? AR: Well this issue is not an environmental issue ultimately. With a classic environmental issue all you needed to do was to convince governments of the fact that there was an environmental wrong and as soon as governments were aware of it they would remedy that situation. That continues to be a wrong analysis of the climate crisis. Governments are well aware of climate change and its impacts. The problem is that the changes that are required are of such a deep economic level that they’ll change fundamentally our economies. Those in power and those influencing our decision makers at the moment are loathe to make those changes. And why would they? I always say it’s like asking cigarette companies to sponsor a conference on lung cancer and then expect them to say ‘stop smoking’. That’s just not going to happen. And those are the kind of forces we’ve been facing. For many years they’ve explicitly campaigned and lobbied against the climate science and when they can no longer campaign against the science they’ve campaigned to make sure that any action is delayed, is not proportionate to the challenges that are out there and includes many false solutions such as carbon markets. So until we deal with the economic and vested interests I think we’re not going to be able to get the kind of agreement that is needed. PE: The Polish presidency seems to be shameless in its association with some of the worst polluters. They’ve got them all on board as sponsors this year and they’re also holding a world coal conference at the same time. What are they thinking? How are we expected to get anything useful with a presidency that thinks coal is part of the solution? AR: Absolutely and it’s a very deliberate and provocative move by the Polish presidency but they, I think, are only the most visible and the most open. When you hear the Polish government openly say in their own domestic parliament and press that the reason that they want to host the COP was to ensure their political and economic interests were safeguarded, they were just being much more explicit than other developed countries. It’s the equivalent of the United States saying the lifestyle of an American citizen is not up for negotiation. That’s an impossibility when an American citizen is personally responsible for over 20 tonnes of CO2 [per year] while those in Africa have a footprint of less than one [tonne]. A toddler by the age of one year in New York will have emitted more CO2 than someone in Tanzania will emit in their whole lifetime. The gross inequality, inequity of our system needs to be challenged. And there are lots of very powerful figures and interests who just don’t want that to happen. So yes the Poles are being more explicit about the dirty energy sponsorship, [vested interests] are sponsoring everything from the pens, paper, water coolers, water cups, even the building itself, and they’re trying to give those dirty energy corporations a much more powerful and enhanced voice in the climate negotiations. But let’s not be fooled that that’s something new. It’s just that many corporations have been doing their dirty work behind closed doors at a national level. But this is being challenged. The “clean coal” summit for example will become the focus of large civil society protests, with people coming together from the trade union movement, environment, development, as well as communities impacted by dirty coal all around the world simply saying, ‘No, coal does not have a future,’ and ensuring that the energy mix we do have for the future is clean, safe and affordable. PE: Finally, what message do you have for people who can’t be in Warsaw but still want to work on these issues in their own locality? AR: Actually that’s the most important thing. Being in Warsaw is not really necessary. What we really need to do is build a powerful movement. A movement so powerful that we do not just put hundreds of thousands of people on the street but a million people on the street. If we want an agreement in 2015 that is going to go some way to save not just the planet but the billions of people who are going to be impacted in terms of drought, famine, hunger and conflict then we need a very powerful climate justice movement. It has to be connected both at a national and a global level. So the issues that people are fighting at a national level to stop dirty energy corporations are important and people need to continue to do that, but they need to continue to link those with our demands to our governments for the kinds of emissions reductions that are required. We need to find those collective moments, such as during Reclaim Power, when we can collectively come together and amplify our strength and engage new people. That’s the only solution we have to ensure those summits come out with something positive. 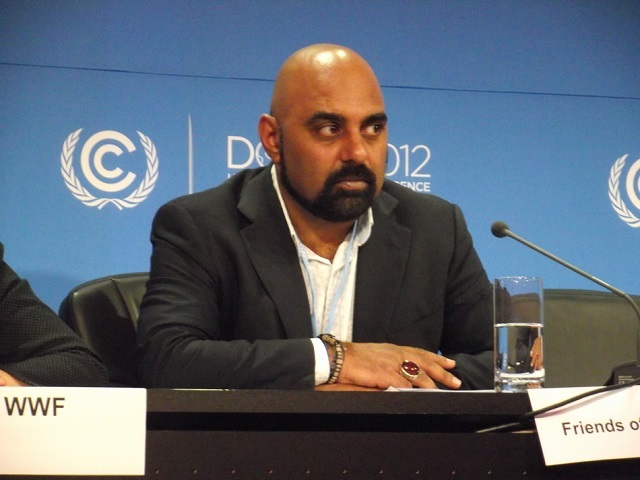 Asad Rehman is Senior Campaigner (International Climate) at Friends of the Earth (FoE). Asad leads Friends of the Earth's campaign for international action to prevent dangerous climate change. He's one of FOE's key spokespeople at UN climate negotiations. His work focuses on cutting global greenhouse gas emissions and helping poor countries to develop in a clean and sustainable way.